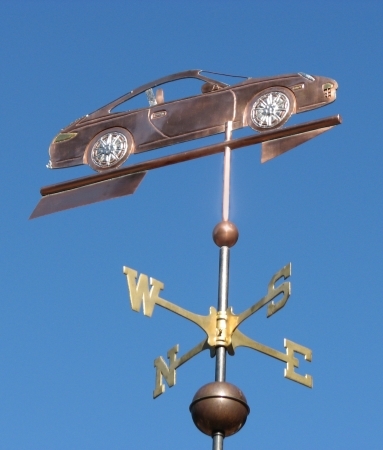 The Porsche Carrera Weathervane shown here was originally commissioned in 2008 by a customer in Tennessee. He was building a new four car garage, affectionately dubbed ‘Garaj Mahal’ with a 42” square cupola on top. He ordered his weathervane in the medium size (two-foot sculpture piece) to complement the scale of the building. He also requested optional gold leaf for the tail and side lights and palladium leaf on the door handles, hubcaps, headlights, back bumper and side support. As his copper and brass weathervane takes on the beautiful patina of age, the optional leafing will remain bright, enhancing the contrast in color between the different metals. We typically offer our silhouette weathervanes in the small (one-foot sculpture piece) and medium (two-foot sculpture piece) sizes. If you are looking for a larger weathervane, we recommend going with a swell-bodied style or fully 3-D weathervane. Swell-bodied and 3-D vanes consist of multiple shaped pieces that are then soldered together, providing important structural support. We are often able to reduce the design fee for some of our more mechanical weathervane commissions if detailed schematic drawings are available. Also helpful are detailed photos of the actual vehicle. Photos of insignia, detailing, interiors, etc., make personalized enhancements to the weathervane possible. If actual scaled down models are available, we often find them helpful guides during the construction process. 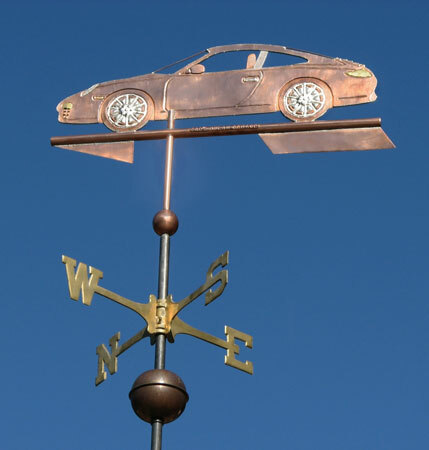 In addition to the Porsche Carrera, we also offer a silhouette Porsche Roadster weathervane. The Porsche Roadster weather vane is made of a single sheet of medium gage copper while the Carrera vane is made up of several layers of copper to which considerable detail has been added. The Carrera also has a half arrow to indicate wind direction while the Roadster does not. Depending on your preference and budget, we can add or subtract features to arrive at the combination that works best for you.